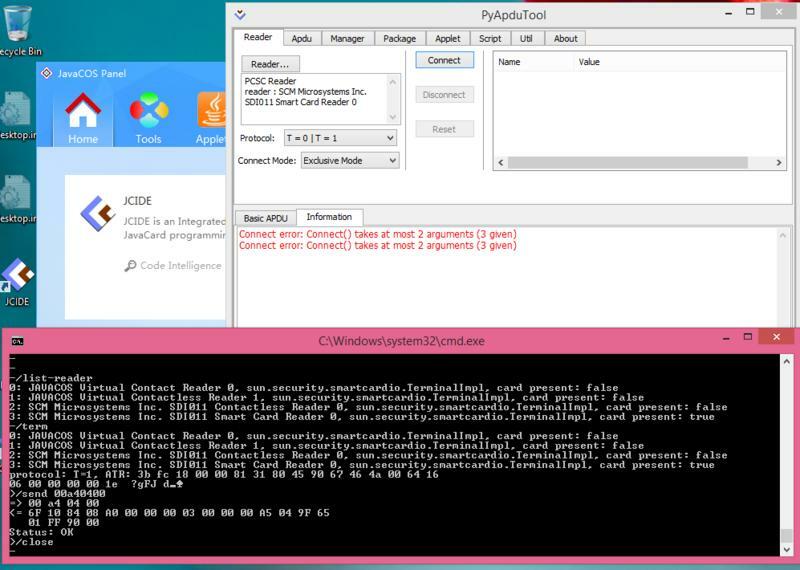 You can use pyApdutool to download a package, install an applet, delete a package/applet, send an APDU command, execute a SCR script, or look up an error code. 2. Connect the card/virtual machine. Click Reader… button. Select a reader from Reader: drop-down list. Specify a protocol in Protocol area and select a connect mode, then Connect. 3. Download a package. Select Manager tab. If your card can provide GP functions, check GP. Click Cap File… button to choose the CAP file to be downloaded. Click Download to download a package. Click Install to install a package. Click Select to select a package. 4. Delete all packages. Select Manager tab. Click Start button in Remove Packages area to delete all packages in order. If you check Rand option, the packages will be deleted randomly. 5. Delete a specified package/applet. Select Package/Applet tab. If the card can provide GP functions, check GP Type option also. Click Refresh to display all packages/applets in the card. Select the package/applet you want to delete and click Remove. 6. Send an APDU command. Select Apdu tab. Type the APDU command you want to send. Click Send. 7. Execute a SCR script. Select Script tab. Click Scr file: button to choose the SCR script you want to execute. If the card can provide GP functions, check GP option also. Click Play to execute the script. Or AA BB CC DD EE. 8. Search for the description of an error code. Select Util tab. Input the error code. Click Lookup button. 1. Download this tool from the following attachment file. And it also exists in the Development Kit, click Development Kit to see more. 2. Download pyApduTool from Google Drive. Could you please tell us the OS version of your computer and the modification time of JCIDE installation package ? My computer OS is Enterprise version of Win 10. And I downloaded the latest version of the JCIDE. But I can use pyApdutool without any error no matter where and how i start it . The software you are using is an old version. You can download the latest version of JCkit. With this version, we have already test the problem you mentioned. It works fine. Moreover, our JCIDE is being fully upgraded now and will be completed soon. After upgrade, it can provide more powerful features. Stay tuned. Thank you for your approval and support! Much appreciated! And we will continue improving this tool in order to provide a more intelligent and powerful tool for java card developers. Thanks! Hi! Can the tool use JCRE 3.0.5? irvinmags wrote: Hi! Can the tool use JCRE 3.0.5? Yes, it can. And it has nothing to do with JCRE version! Any other problem, feel free to contact us!